Physician extender is a term used by doctors and other health professionals to define two kinds of healthcare providers - nurse practitioners and physician assistants. Physician extenders work closely with a supervising doctor and provide invaluable help. Some people are hesitant to see physician extenders. You always have a choice in whom you wish to see; however, with the shortage of doctors, especially kidney specialists, physician extenders are important in providing care. Depending on where they work, their duties can vary. The focus here will be on their potential roles in a nephrologist's practice. The nurse practitioner has earned a bachelors degree in nursing, and has an additional graduate degree. Working with a kidney doctor, she can see patients in the office or hospital setting, order blood work and other tests, and prescribe treatment, including medication. The physician assistant has obtained a bachelors degree, usually in a health sciences related field but this can vary, with additional graduate training resulting in a masters degree. The range of care offered by the PA is similar to that of the NP. You will likely encounter both the NP and PA in many physician practices and hospitals. Depending on the cause of your kidney disease, you will likely be seeing other specialty doctors. For example, if you have diabetes and diabetes-related kidney disease, you will probably see an endocrinologist (endo-krin-ala-gist), or blood-sugar specialist. And if you have heart problems, then you are likely following up with a cardiologist (kar-dee-alla-gist), or heart doctor. Other members of your health care team may include practitioners of complementary medicine, induding homeopathy, natural medicine, massage therapy, acupuncture, and others. Certain complementary treatments or supplements can interact with prescribed medication and may influence kidney function. Therefore, there should be open communication between you, your kidney spedalist, and your complementary health providers. The key is to take full advantage of all of your healthcare providers' skills to ensure a coordinated plan of care. As the patient, you are the most valuable player on your healthcare team; you are the captain of the ship, so to speak. The job of the other team members is to inform and empower you to make the best treatment decisions possible. You, however, are ultimately responsible for your own health. As with any team, there are rules that need to be followed in order for it to be successful. The most important rule is communication. Your health care team members need to communicate respectfully and effectively with you and with each other. The most common method of communication is through paper correspondence. After an office visit, some health providers may write down a visit summary; others may choose to talk into a tape recorder or other recording device, and then have their notes transcribed onto paper. Regardless of the recording method, visit summaries often include an assessment of your medical condition and plan of care. Copies are either faxed or mailed to each of your healthcare providers. Depending on the nature of the visit, telephone communication may sometimes be needed. 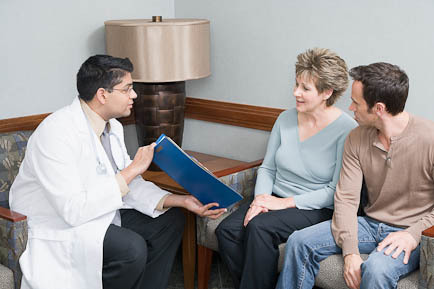 Comprehensive CKD clinics are becoming popular with patients and doctors alike. These fantastic clinics allow for frequent follow-up office visits, especially for patients in the advanced stages of CKD, where more coordinated and structured care is needed. Another benefit of these clinics is that they allow various members of patients' healthcare teams to come together, which facilitates communication. CKD clinics can take many forms, depending on the specific office practice. In many cases, the physician extender works closely with you and your kidney doctor for more frequent follow-up care. For example, if you have advanced CKD, you may visit with your kidney specialist every two to three months, although this can vary. In between visits with her, you may be seen more frequently by a physician extender. Depending on your particular situation, you may also be seen by a nutritionist or a case manager, if needed. This is good for continuity, and many people do better with this "team approach" to care. To find out more, you can check out Kidney Disease Treatment Options.